Last week I wrote a long post about how West Sussex County Council are proposing to use millions of pounds of ‘sustainable’ transport funding (distributed by the Coast to Capital Local Enterprise Partnership) on schemes that have negligible (or even non-existent) sustainable transport benefit. Even those parts of the schemes that, by West Sussex’s own admission, have no sustainable transport benefit whatsoever, could obviously be designed to accommodate walking and cycling routes. But West Sussex have chosen not to do this. They want to build very large roundabouts on the edge of a major town that have absolutely no walking and cycling provision. In that post I described how this is symptomatic of a wider problem with cycling outside of cities in Britain – West Sussex in particular is just one many local authorities that have no consistent stream of funding for genuinely sustainable transport, no real enthusiasm for engaging seriously with cycling as a mode of transport, and little or no expertise on how to design properly for it. What cash that is available for cycling from central government – either through these LEP channels, or through the Local Sustainable Transport Fund – appears to dribble away, used on schemes and projects of negligible benefit. This post is the first in a series that will examine what West Sussex has done with the £2.46 million of cash the county was awarded by the DfT for sustainable travel projects, to be spent between 2012 and 2015. West Sussex’s initial bid was for £5m, for four towns and cities – Crawley, Worthing, Chichester and Horsham. 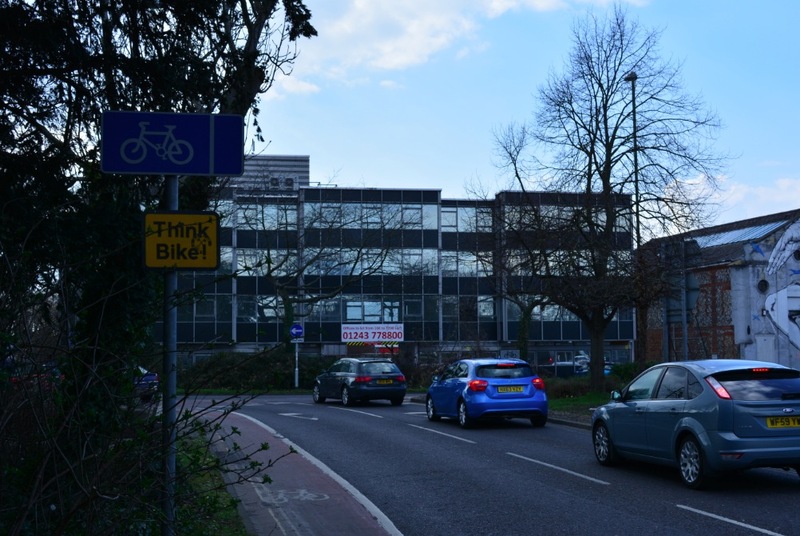 The DfT rejected that bid, and only chose to fund the schemes for Chichester and Horsham – about half the total bid (hence £2.46m). So these posts will cover where those millions of pounds have gone, in Chichester and Horsham. It should also be borne in mind that the total spend will be significantly higher, with matched funding from the local authority in many cases. A case in point is the subject here. 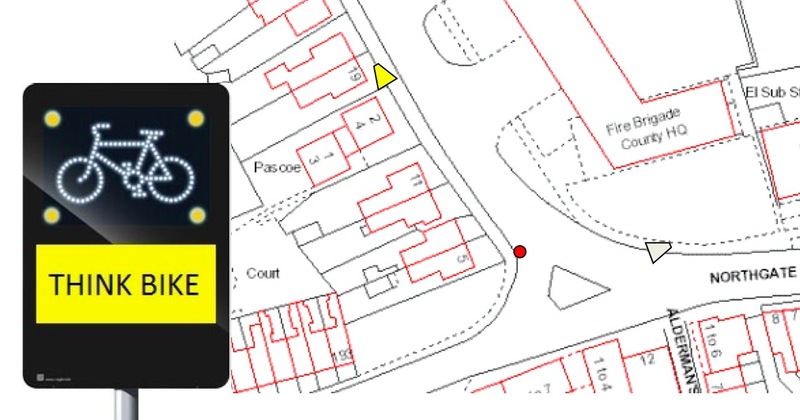 £140,000 of that DfT cash is being spent on the Northgate Gyratory in Chichester (with a further £70,000 coming from West Sussex’s own road safety budget). This is a very busy road system – dubbed ‘The Fire Station Roundabout’ (because it has a Fire Station in the middle of it) – just to the north of Chichester city centre. It is where the city’s inner ring road meets roads heading off to the north, out of Chichester. What is that £210,000 buying? A repainting of the existing cycle lane markings. Some solar-powered flashing signs telling drivers to ‘Think Bike’. 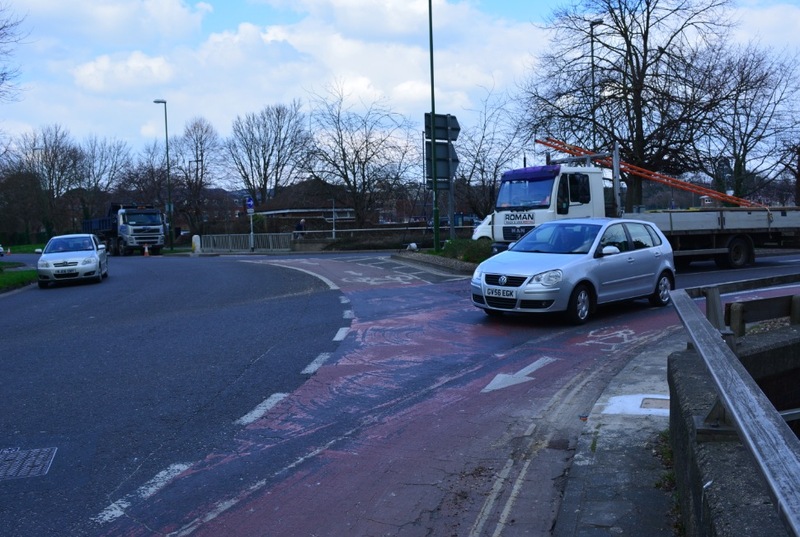 It should be borne in mind that the Northgate Gyratory is a significant barrier to cycling in Chichester – to get in and out of the city centre from the north, this roundabout has to be used. And it also has a safety problem – despite its innate hostility obviously suppressing cycling, there have been six serious cycling injuries in the last nine years. So this is a shambles. Frankly, the money has been wasted. 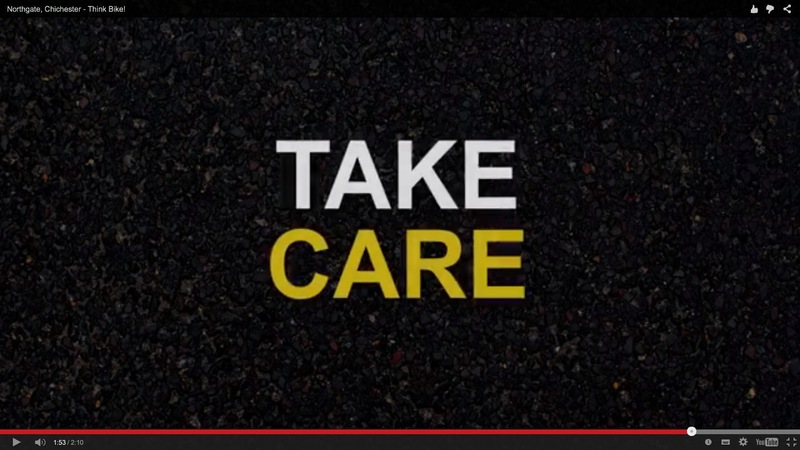 Here’s the video West Sussex have produced to publicise the repainting of the cycle lanes, and the new flashing signs. The basic problem here is that the existing design for cycling is dire, and it isn’t being changed. The crap cycle lanes are being repainted, and the flashing signs smack of desperation, an attempt to mitigate the inherent flaws in the road layout (although, as we’ll see below, the signs appear to have arrived with an earlier, and even more hazardous, version of this scheme that has been abandoned). By definition if you need to have such signs, surely this means you haven’t designed your roads properly for cyclists. 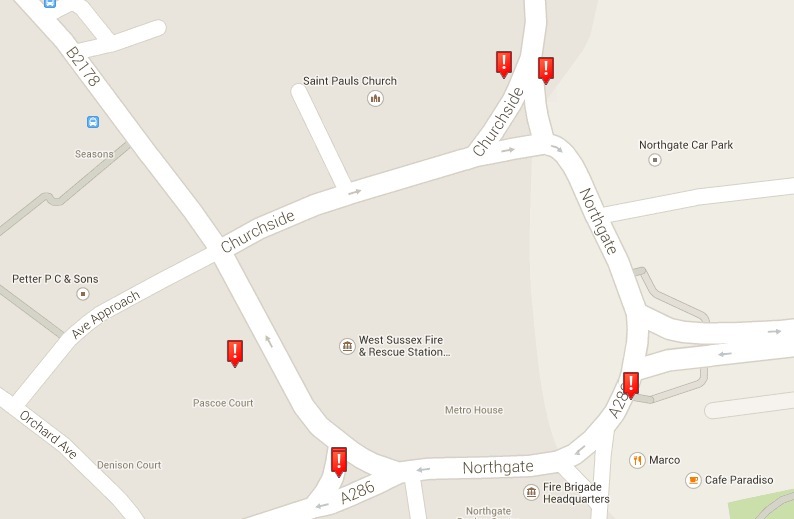 It should be noted that there are already signs at Northgate gyratory – signs that aren’t electronic. I doubt flashing signs will do much to address the risks for people cycling at this gyratory, any more than the existing metal ones do anything. 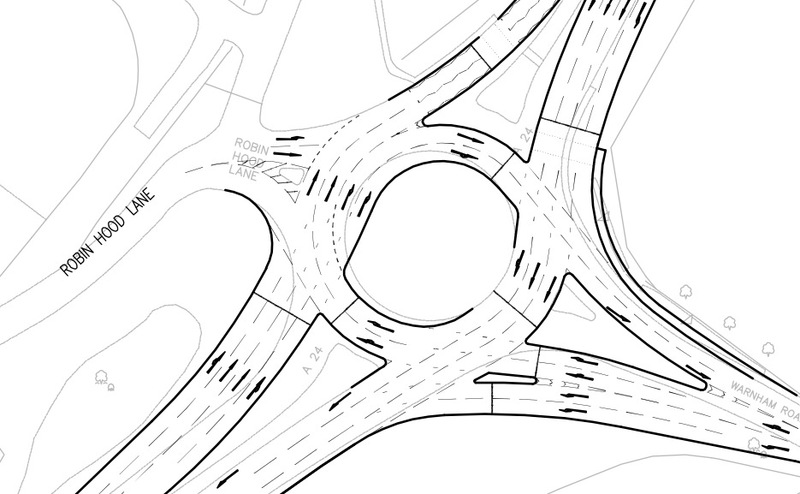 The problems are the result of poor design, on both entry and exit to the roundabout. On entry, drivers will not be looking in the direction cyclists are coming from, which is almost from behind them. Their attention will be focused instead on the roundabout, looking for gaps in motor traffic. This problem is compounded by ‘masking’. 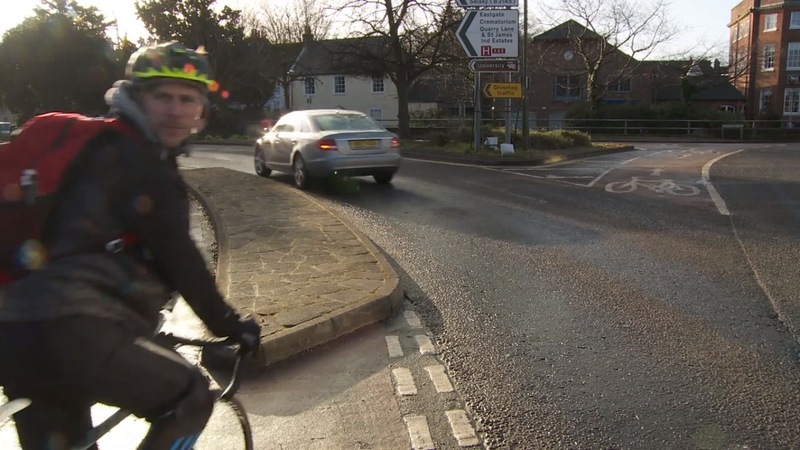 Even if drivers are looking in these two different directions, those in the nearside lane will often have their visibility of the cycle lane obscured by motor vehicles in the outer lane. To repeat, this design is not being changed. Just repainted. Likewise on exit, collisions occur because drivers are unsure about where people cycling will be going (or make assumptions about their direction), while similarly people cycling will be unsure about whether drivers will be entering or existing the roundabout. For example. The blue arrows represent a driver and a cyclist. At the positions pictured, neither has a clue what the other is going to do – stay on the roundabout, or exit it. That uncertainty is a recipe for collisions. Safely navigating this cycle lane involves looking back over your shoulder, through 180°, in an attempt to observe what motor traffic behind you is doing. Conveniently this is even demonstrated in West Sussex’s video. Again, to repeat, this design is not being changed. Just repainted. The problems described here are the kinds of problems that need to be resolved, yet won’t be. People cycling are not in visible positions, and when they are, there’s uncertainty about who is going in which direction. 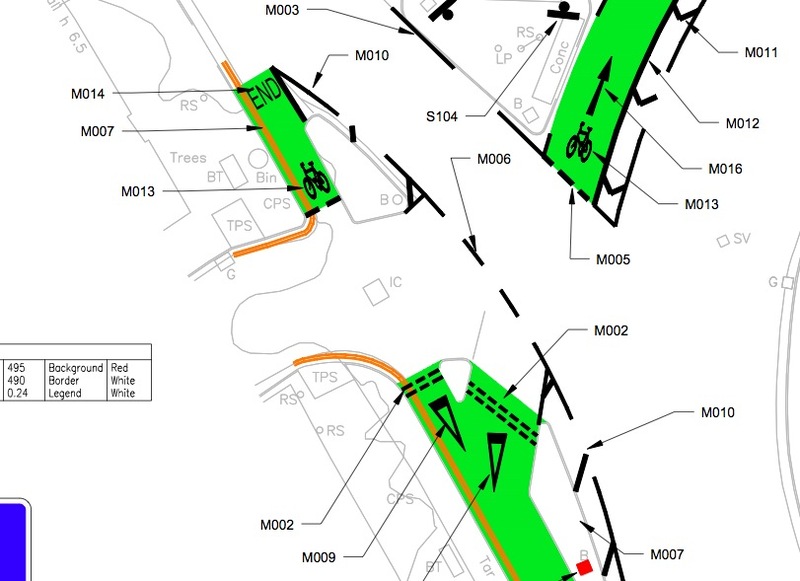 The cycle lane design remains very similar to the existing layout. There still remains the danger and conflict that I and many of my neighbours have experienced on this system. This is; the high speed of exiting traffic at each junction, the lack of visibility for the kerbside driver when two vehicles are at a two lane entry, the failure of drivers to signal when exiting, and the lack of lane discipline/lane markings on the gyratory system. I’d also add that even relying on drivers signalling their intentions to exit (or stay on) the roundabout, is simply not good enough, because if someone doesn’t signal, or signals in error, and their intentions are (mistakenly) assumed, the consequences would be catastrophic. The black car isn’t signalling an intention to exit. Staying on the roundabout? So there is a series of clear, identifiable safety problems, that are a direct consequence of the existing design, which is merely being repainted. The issue is not a general lack of ‘awareness’ of cyclists – awareness that needs to be ‘raised’ by a number of flashing signs -as the video and the poster imply. Pay attention! That’ll do it. 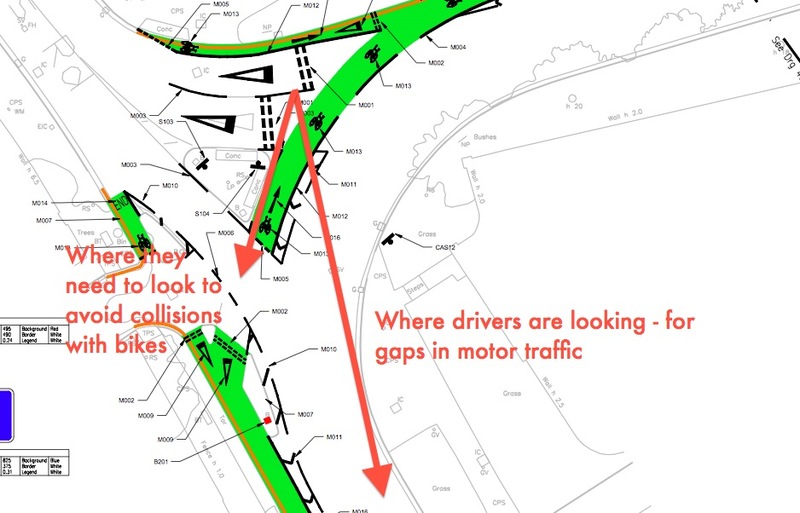 Imagining that the remedy to the collision record of Northgate is ‘taking care’ or ‘paying attention’ represents a spectacular misdiagnosis of the actual underlying problem with the gyratory – crap design. Here’s a video I’ve taken showing one of the exit points of the gyratory, in the south-west corner. The video essentially speaks for itself, but a few things can be observed. Traffic on the gyratory is pretty much continuous, even at this relatively quiet time of the day (the middle of the afternoon). Without knowing with certainly where drivers are going, you will almost always have to come to a complete stop to cross the exits if you are using the cycle lane. Notice that many drivers do not signal their intention to exit – 0:28, 0:32 0:50, in just this short clip. Indication plainly cannot be relied upon, despite the implications of the West Sussex video. Assuming drivers are staying on the roundabout because they’re not indicating would be a very bad idea indeed. Notice how the man cycling has to look directly behind him (1:03), even when not crossing the exit. The pedestrian environment is also terrible; notice the struggles/uncertainty about how and where to cross at 0:35. The issues are essentially identical to crossing the exits by bike. Are just being repainted, without any apparent thought about whether they are even necessary. Sensible advice would be to avoid these cycle lanes entirely, if you feel confident enough to do so, and to cycle with motor traffic on the roundabout, to minimise the problems of intervisibility described here. That’s a pretty dire state of affairs considering this is supposed to be a six-figure ‘improvement’. But it could have been even worse. 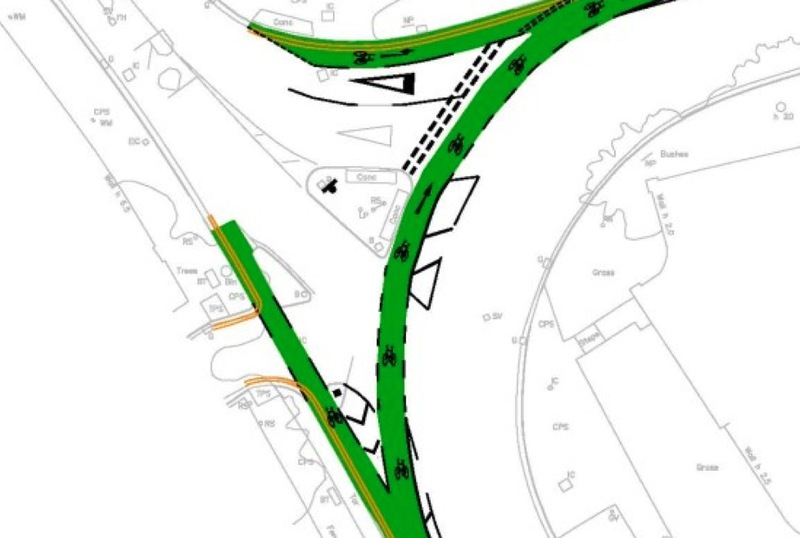 The initial plans from West Sussex for this gyratory proposed giving cycling priority on both entry and exit. This was really a dreadful idea, given all the aforementioned problems of uncertainty. There’s certainly nothing wrong with giving cycling priority over motor traffic, but not with this kind of geometry, and with these kinds of speeds on exit. The flashing warning ‘Think Bike!’ signs were included as part of this scheme, again presumably in an attempt to make it slightly less lethal. But this ‘priority with paint’ design appears to have been abandoned following a road safety audit, leaving us with the status quo. Plus the signs. So £210,000 is going to be spent doing essentially nothing. 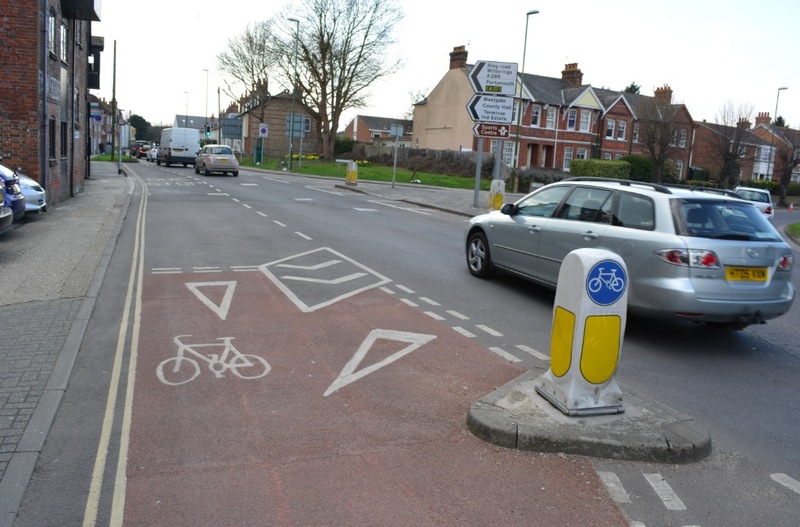 Unfortunately, I suspect that simply wasn’t enough money in the first place to come up with a serious, design-led solution to the issues with this roundabout, drawing on best international practice in designing cycling infrastructure that is safe and attractive to use. 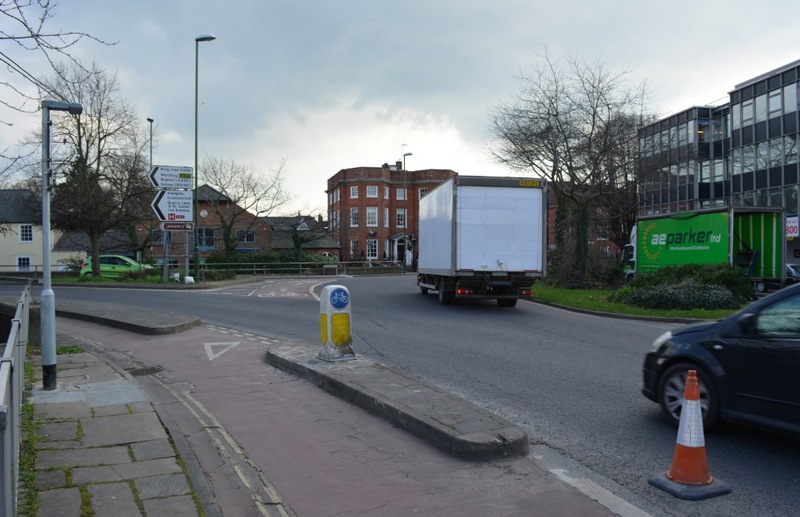 There’s plenty of space at Northgate for a major redesign, accommodating cycling infrastructure of the type seen in David Hembrow’s video above, and described in his blog post here. But the aimless result we’ve ended up with has probably flowed from that initial problem of insufficient cash. Northgate needs a major physical redesign, and £210,000 was never going to be enough. Maybe West Sussex weren’t ever that interested in examining serious alternative designs, or in devoting a large chunk of the money they won from the DfT on implementing one scheme, preferring instead to spread it thinly on a large number of schemes that look good, presented as a nice long list, but which are ineffective in practice. Meanwhile the old paint is being scraped off, ready for new paint. Next week I’ll be looking at another West Sussex scheme, also involving six figure sums of LSTF cash. Stay tuned. This entry was posted in Infrastructure, Subjective safety, Sustainable Safety, Uncategorized, West Sussex County Council. Bookmark the permalink. As cyclist these schemes are diabolical! We have same in Poole Old Town with new Twin Sails Bridge + Poole Lifting Bridge. Very little attention to cyclists and pedestrians! I’ve only just realised that this was the gyratory that caused a couple of cyclists in our Lambeth Cyclists group to have crashes, independently, on the same night, in the same place. We were on a weekend cycling trip to sites in and around Chichester a few years ago, and a very lovely weekend it was too. Unfortunately two people came a cropper from the kerb buildouts, very much like, if not the actual kerbs in the fourth photograph down in your post. Ironically these are the things that were meant to keep cyclists safe, but in the dark they are not so visible and it’s all too easy to hit them. One of our party made an independent claim against the council because of the injuries sustained but I don’t know what came of it. We (I) wrote to the council with a formal complaint, with recommendations for short and medium term mitigation. Not sure if that had any influence on the choice of this site for these measures, but anyway I’d argue the gyratory itself is completely unnecessary. Good posts, glad you find the time for them! This seems to be the common approach of “if we educate everyone it’ll be fine”. Apart from the obvious and simple fact that this is entirely untrue—it doesn’t cater for either human error or the fact than many people ignore eduction—it overlooks the point that you simply can’t reach everyone with a video. If the video is important, how can you make everyone using the roundabout watch it before using the roundabout? You can’t, clearly, so it’s quite plain that the vast majority of the people using this roundabout will not have seen the video. The roundabout must work without it, or fail. Any defence of the value of the video is an admission of failure in the design of the roundabout. It’s as simple as that, and it’s not a matter of opinion, it’s one of basic logic. It’s unclear to me at the moment where “the scheme has improved visibility”. Adding eye-catching signage is surely a visual distraction, and there appears to be no hard engineering that affects visibility. I did have a look at the detailed plans, and I couldn’t spot any areas where they differ from the existing layout. There are opportunities for cutting back some vegetation on the north-east corner though, where visibility is dire – I wonder if that’s what WSCC are referring to? Hello, I live in Chichester on the road leading to the roundabout in question in, Franklin Place. I ride around the Gyratory every day on my commute to and from work. I want to thank you for drawing attention to the fact that the ‘cycle friendly’ design of the Fire Station roundabout is frankly diabolical for cyclists and drivers and causes more incidents than it prevents. The majority of cyclists I see on the Gyratory have recognised this too and actually ride on the road so that they are not having to constantly cycle in the drivers blind spot and stop at each exit for traffic, straining their necks to look behind them to find a safe spot to cross. From a drivers perspective, the roundabout is so large that it can be genuinely confusing figuring out which lane to drive in (I say this as someone who has driven it for 10 years). The scale of the roundabout means indicators seem to be an after-thought and are only used when exiting, which becomes a problem when driving in the outside lane past a waiting cyclist who doesn’t want to take the risk that the driver isn’t turning off. It’s like a game of Russian Roulette. ‘Colouring in the lines’ on the cycle lanes is like putting lipstick on a pig. 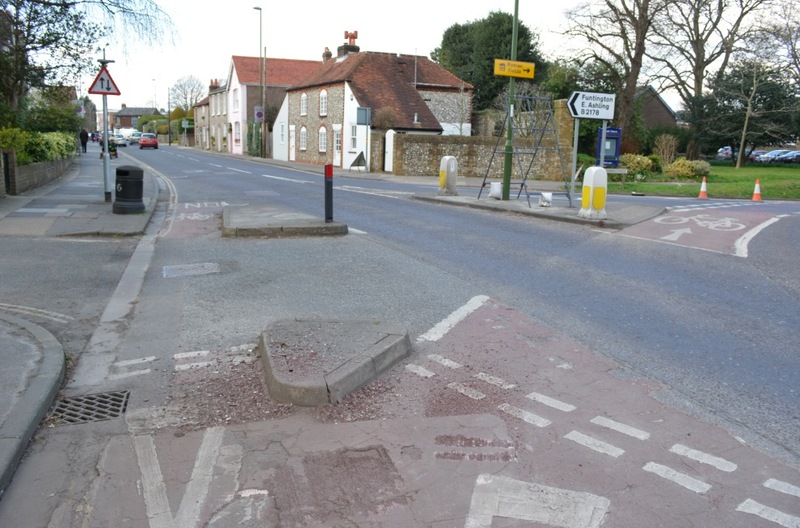 Put your money where your mouth is Chichester Council and go for a complete re-design that genuinely helps both cars and cyclists drive safely. WSCC are literally putting lipstick on a pig in this scheme. Just awful, and an awful waste of an awful lot of taxpayers money. They aren’t needless. They allow buses to pull in to the bus stop & cars to turn into Avenue Approach without worrying about fault if they collide with a cyclist. I used to live only a few hundred metres (Cavendish Street) from this gyratory. How I remember with joy being shouted at by an irate motorist for not using the cycle lane provided. I also remember being stopped by police very late one evening for cycling in a deserted North Street. I noticed recently that this is now permitted. Chichester could surely be an ideal city for mass cycling. Dream on. One of the main reason that I moved away from West Sussex was because I felt unsafe there as a cyclist. Despite living in the countryside the road I lived on was used as a rat run and was the most dangerous road that I’ve ever cycled along. It’s a shame that such a beautiful area of the country is ruined by too many cars and lack of provisions for cycling. It’s interesting that of four schemes put forward by WSCC only two were funded by the DfT. So, this scheme was chosen by some committee at the DfT and we should be blaming them for this ridiculous outcome. WSCC is trapped in a system of small scale, short term grants allocated by a beauty parade in front of officials who seem to want the maximum number of schemes for the money. 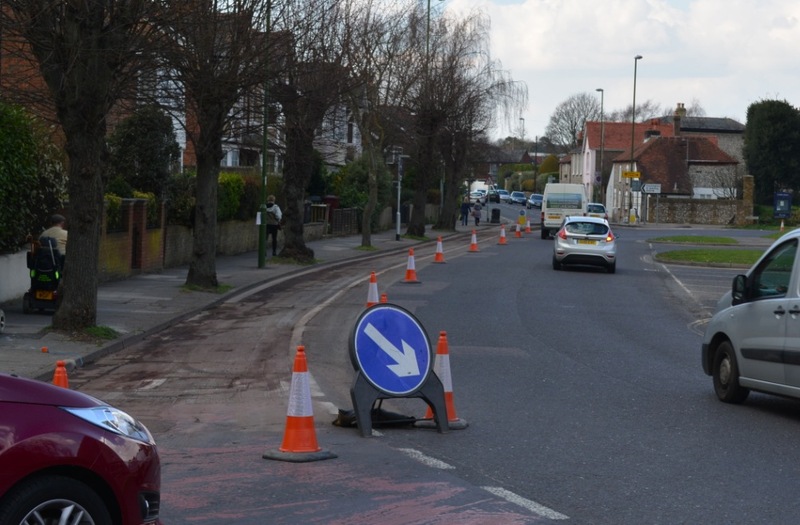 I expect there’s an unspoken understanding that a scheme which properly dealt with this junction would be too expensive to be funded, so WSCC are just responding to the incentives of the system they are operating in. The body with power in this situation is the DfT and its that body which needs to change. The minister could set a policy that only schemes which engineer out risk will be funded, but the people making the decisions seem to favour cheap, useless interventions. I’m very pleased to see that the lethal design was eventually ditched, although it took a year of pointing out the dangers direct to WSCC before they spotted the problem. Far too late to re-design, sadly. The consultants who produced the design should be as embarrassed and ashamed as WSCC Highways should be: they’re supposed to be professionals! 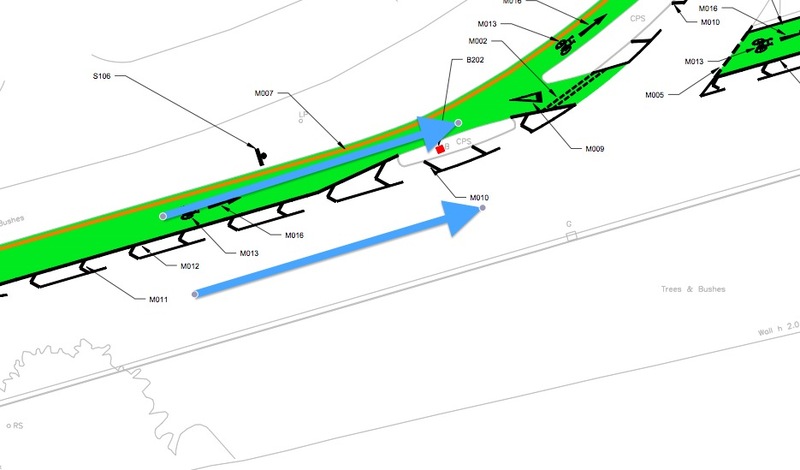 I don’t think a decent solution need have cost that much: it just needed the kerbs separating the cycleway from the carriageway to be moved a bit at each junction, so that bikes and cars cross paths at right angles instead of nearly parallel. The coloured surfacing they’re using is very expensive, and unpopular with cyclists as it makes a very rough surface to ride over. As others have pointed out there is plenty of space: the carriageway isn’t quite two lanes wide, and could easily be reduced to one wide lane. That would also help motorists, who often find the roundabout to be treated much like a race track by some motorists. How about a sweepstake: how long before the electronic signs stop working through lack of maintenance? Interesting, I stand corrected. Thank you. Of course WSCC would prefer everyone to think that the restriction on only funding schemes in Chichester and Horsham were imposed by DfT, so that’s the story you usually hear. It’s a rather worrying indication of how arbitrarily some quite major decisions about public spending get made. It’s a little odd that Worthing and Crawley councillors didn’t make any fuss about this: they’ve missed out on hundreds of thousands of pounds of investment. I think the problem is that WSCC hold all the cards, as they’re the highway authority. There are almost certainly party-political issues involved, too. This just shows why we need clear national design guidance, informed by the best international practice, so that schemes like this cannot get the go-ahead. And yet at the Cycling Delivery Plan consultations the DfT was resisting this, despite loads of professionals and campaigners clamouring for it. That is just a terrible roundabout. You have the right to safety and life as defined by the European convention on human rights. The UK is being negligent in this. It is being told over and over, given countless statistics, flawless reasoning for going Dutch, it has piles of money that it can use if it wanted to, and it has the capability to design what it wants. An ombudsman needs to put a stop to this, and the DfT and Parliament needs to be told of this error. I’d even like to take this massive failure to the European Court of Human Rights if I could.